(7/10) In a nutshell: Kosmichesky Reys: Fantasticheskaya Novella is a stunning, costly Soviet moon landing adventure from 1935, inspired by Fritz Lang’s 1929 film Woman in the Moon. Thanks to the collaboration of a noted space and rocket scientist, it is impressively accurate. The film is aimed at a juvenile audience, and it’s a very enjoyable and exciting space adventure movie. Cosmonaut Andryusha (Vassili Gaponenko) is a child actor who actually managed not to be annoying. Kosmicheskiy Reys: Fantasticheskaya Novella, known internationally as Cosmic Voyage or The Space Voyage, is without a shadow of a doubt the best science fiction film to come out of the USSR in the thirties. More so, it is probably the best sci-fi movie to come out of Europe in the thirties, which is a pretty sad statement on the European science fiction scene in that decade (though we sort of did have other stuff than moviemaking to think about at the time …). Although aimed at a juvenile audience, the film is based on hard (albeit speculative) science, and depicts a journey to the moon as realistically as was possible in 1935. 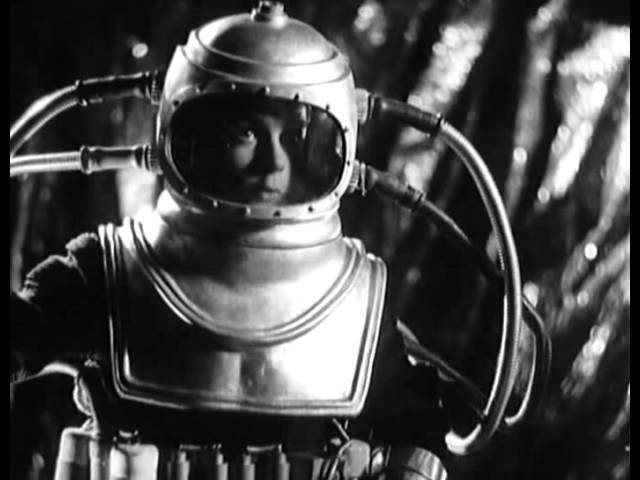 Fritz Lang came even closer to reality with his eerily accurate 1929 film Woman in the moon (review), but Cosmic Voyage isn’t far off the mark. Released in late December 1935, the film was the last all-out science fiction film to be released in the Soviet Union until Nebo Zovyot (The Heavens Call, released re-edited and with additional footage as Battle Beyond the Sun in the US), released in 1959. Director Vasili Zhuravlyov in latter years. The film, which depicts an old scientist and two unlikely colleagues making the first flight to the moon, where they run into trouble with a botched landing, a landslide and a damaged oxygen tank, before making their way back to Earth, was the brainchild of the 29-year old director Vasili Zhuravlyov. 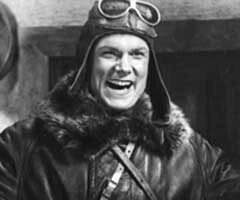 Zhuravlyov, an actor by training, had directed a handful of films, ranging from documentaries and comedies to communist-themed children’s films like Bombist (The Bomber) and Revanzh (Rematch or Revenge), when he started to work on the film in 1933. Officially it is an adaptation of scientist and author Konstantin Tsiolkovsky’s book Vne Zemli (Beyond the Planet Earth), although the plot bears almost no resemblance to his original story of an international crew of adventurers who settle down for an extended stay in a space habitat before moving onward to the Moon and Mars. Instead the film draws heavily on the story laid out in Lang’s Woman in the Moon. But by using Vne Zemli as an official starting point, Zhuravlyov was able to get Tsiolkovsky on-board as a technical adviser and designer – not that anything seems to indicate that he would have needed much coaxing to come along anyway. Science fiction was in itself not held in very high regard by the early communist rule, rigorously scrutinized by Joseph Stalin, the great film lover, himself (see my review of Aerograd  for more on Stalin the movie mogul). But, in 1933 the call went out from the communist youth league Komsomol, that they wanted a film that would encourage kids to take an interest in space research. Since Zhuravlyov was considered a rising star in kiddie cinema, he got the job, and took in on enthusiastically. The film took a whole two years to make, and relied heavily on Tsiolkovsky’s theories about rocket science and the physics of space travel. By now 78 years old, Tsiolkovsky was regarded as something of a genius in his field, and is counted as one of the most important figures in the history of rocket science and space travel. He personally designed all the miniatures and models of the space station, the take-off ramp and the spacecrafts depicted in the film, and was adamant that everything should be as close to realism as possible. This ruled out Woman in the Moon-screenwriter Thea von Harbou’s fantastical elements of breathable air and mountains of gold on the moon. 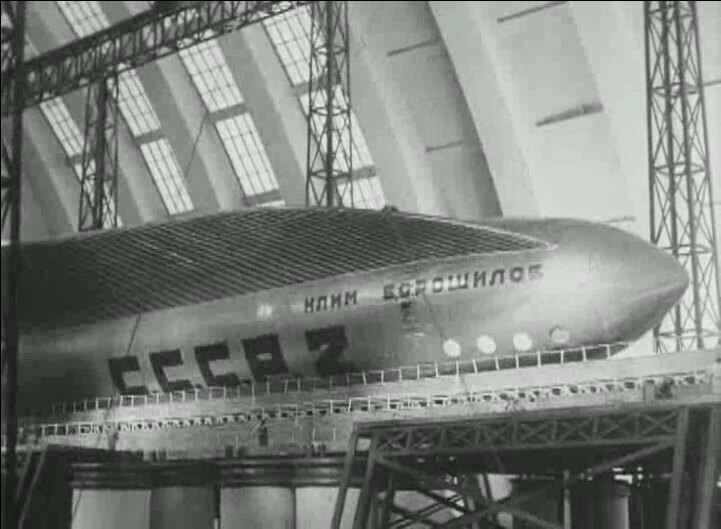 One of the spaceships designed by Konstantin Tsiolkovsky, named after the then Soviet minister of war Kliment “Klim” Voroshilov. I have not found a version with English inter- or subtitles online. I watched it with intertitles in Russian (which I speak a little) and subtitles in Portugese (which is a Latin-based language and thus partly understandable in written form by anyone familiar with Western European culture and languages). Thus I was able to follow the proceedings surprisingly well, with the help of an online dictionary for some of the words, after I read a few synopses. The film is placed in the futuristic year of 1946, and follows the protagonist Pavel Sedikh (Sergei Komarov), an old rocket scientist (modelled on Tsiolkovsky), who is preparing to travel with one of his two rockets to the moon. Unfortunately the space association’s director, Professor Karin (Vasili Kovrigin), has other plans. Karin has conducted two test flights in his own miniature rockets with a rabbit and a cat on-board. The rocket with the cat has disappeared, presumable crashed on the moon, and the rabbit came back with a ruptured heart. Despite Sedikh’s assurance that ”I am not a rabbit”, Karin doesn’t think that the old man will survive the g-forces involved in the flight, and secretly enlists the younger and stronger Captain Viktor Orlov (Nikolai Feoktistov) to take Sedikh’s place. But Orlov’s 10-year old brother Andryusha (Vassili Gaponenko) overhears the conversation. And since he is a big fan of Sedikh’s, he climbs into the old scientist’s window the same evening to tell him about Karin’s and his brother’s secret plan. Ksenya Moskalenko (Marina), Vassili Gaponenko (Andryusha) and Sergei Komarov (Sedikh). Sedikh’s damned if he is going to be left out of his own moon flight, and sets a counter-plot in action. He enlists Orlov’s girlfriend, and fellow professor, Marina (Ksenya Moskalenko), to be his co-pilot on the flight, and sets out to take one of the rockets the same night as Orlov is about to take off. At the space station Andryusha’s pioneer class (sort of communist boy scouts) create commotion as the launch is about to take place, and Marina and Sedikh manage to get aboard one of the rockets, aptly named ”Joseph Stalin”. But, they also get a freeloader, as Andryusha sneaks in at the last moment. But not to worry, the youngster turns out to be quite a capable cosmonaut, and his pellet gun gets the travellers out of a whole host of problems. The voyage itself passes without much incident. The take-off is interesting, inasmuch as the rocket is horizontal, and takes off from a ramp designed like a ski-jump hill. The rocket is a two-stage rocket, very much like those used in reality decades later. It is also impossibly spacious, a common treat in movies, since cramped spaces are hard to film. 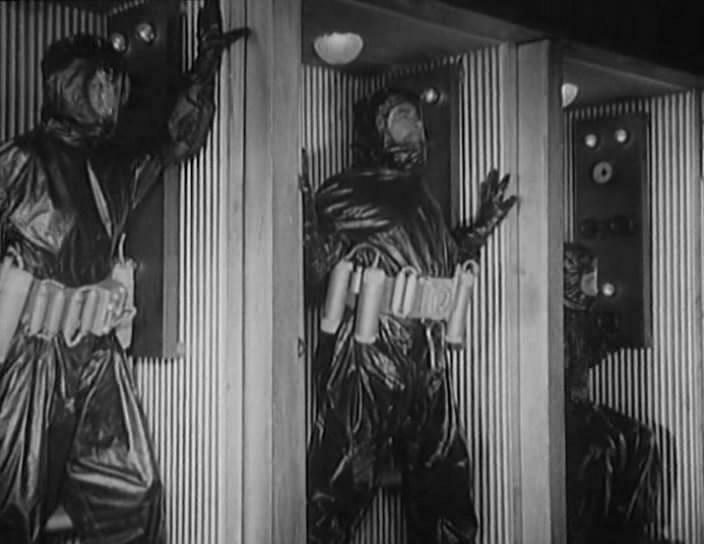 To counter the g-forces, the cosmonauts enter liquid-filled chambers, probably a pretty risky stunt in reality. An interesting point is that despite the fact that Tsiolkovsky was one of the first to calculate that one would have to reach 11,2 km/s to leave the Earth’s orbit, the spacecraft’s speed gauge only goes up to 10 km/s. The wirework used to portray weightlessness is not entirely convincing, but the travellers seem to have loads of fun with it. Weightlessness in the crazy big spacecraft. The problems start when Sedikh lands. A good rocket scientist he may be, but not much of a pilot. Not only does he land on the dark side of the moon, opposite of where they were going, he also manages to rupture one of the oxygen tanks. So not only are they in radio silence, they also haven’t got enough oxygen to get home, and the simple task they had, to find that darned missing cat and plant a message on – the bright side of – the moon, is now going to require a rather daunting trek. But this matters not when they step out on the lunar surface, that looks more like the Rocky Mountains than the actual moon. How they managed to find a space suit in Andryusha’s size is anyone’s guess, but the suits are not bad looking, even though they resemble diving suits and have ridiculously impractically placed air tubes. Some pretty cool sci-fi elements include in-suit radio devices and detachable lead soles that enable the cosmonauts to walk regularly on the moon. But let’s face it: who would want to walk normally when you can leap ten yards with single jump? So the soles are quickly abandoned, which was the film’s undoing. 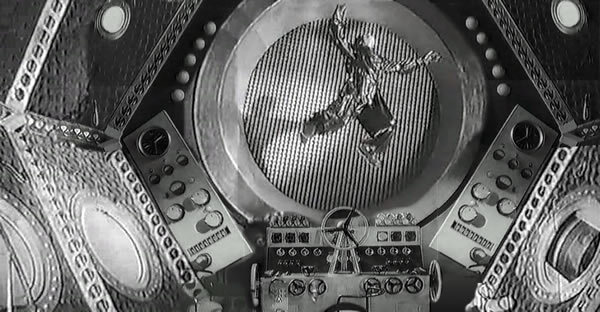 Some of the lesser gravity is portrayed with wires, but the wide shots are made using the same sort of stop-motion techniques that were employed by Willis O’Brien in The Lost World (1925, review) and King Kong (1933, review). Animator Fyodor Krasne doesn’t do a bad job at all, but the scenes of the cosmonauts hopping about do look very cartoony. This was the bit that the censors opposed to, and buried the film for 50 years after just a few month in cinemas. So worried were the censors of not adhering to the principle of Soviet realism, that Krasne got all his credits removed from all films he worked on in the future. Brilliantly designed and lit, albeit not exactly realistic miniatures of the moon (but no-one actually knew what the lunar surface looked like in 1935). At one point Sedikh gets lost from the party, falls down a ravine and is pinned down by a landslide. He is able to alert the others with Andryusha’s pellet gun that he has taken care of, and they find both the cat – alive in the rocket – and some frozen oxygen from the moon’s old atmosphere in the ravine. They then finish the task of spreading out huge amounts of reflective powder on the lunar surface, forming the letters CCCP (USSR). This prompts Karin to launch a rescue mission, but just before it gets underway, the explorers return safely. Hugs and speeches all around. The End. Many things are done right in this film. The characters are very one-dimensional, but in a light adventure film like this, that doesn’t matter much. All actors are good, even if they don’t get to do much to impress. Sergei Komarov is a jovial, kind-hearted and wise old man, representing the noble past of Russia. The character is clearly modelled on Tsiolkovsky, who at one point in time had the exact same kind of beard as Sedikh. Komarov could also be seen in Lev Kuleshov’s 1924 semi-sci-fi film The Death Ray (1925, review), and worked on a few films with Aerograd director Alexandr Dovzhenko. He also played one of the three leading roles in Kuleshov’s internationally prized 1926 film By the Law. Sergei Komarov as Santa Cl … Professor Sedikh. Ksenya Moskalenko is capable and cute, and seems to have gotten the role mostly because of her eerie resemblance to Metropolis (1927, review) superstar Brigitte Helm. Her IMDb credits list only one other film. Interestingly enough, despite the fact that she is a capable pilot and a professor, her main duty on the spacecraft seems to be scrubbing the floor on her knees and preparing dinner. Marina obviously represents the calm, steadfast present of the USSR. Vassili Gaponenko as Andryusha is your typical hyperactive film kid, but Zhuravlyov has managed to get quite a good performance out of him, and the script is so well written, that he actually doesn’t come across as annoying, as is often the case with these kind of roles. This was apparently his only film – and yes, he is the future of the USSR. If Ksenya Moskalenko is not the spitting image of Brigitte Helm, then tell me who is. A small part as the chief ground technician of the space station is played by Sergei Stolyarov, who would later go on to play one of the leading roles (the pilot) in Alexandr Dovzhenko’s subtle sci-fi film Aerograd. 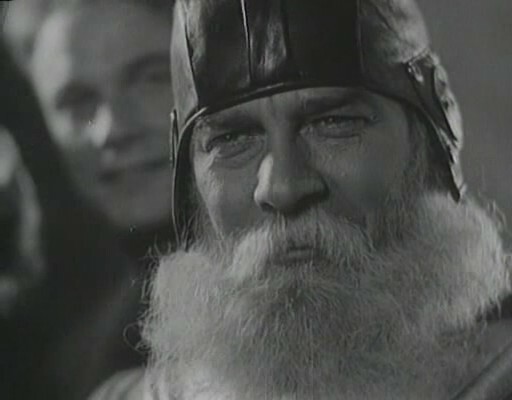 Because of the long post-production period of Cosmic Voyage, Aerograd was actually released before Cosmic Voyage, which meant Stolyarov had become a major film star when the film was finally released. 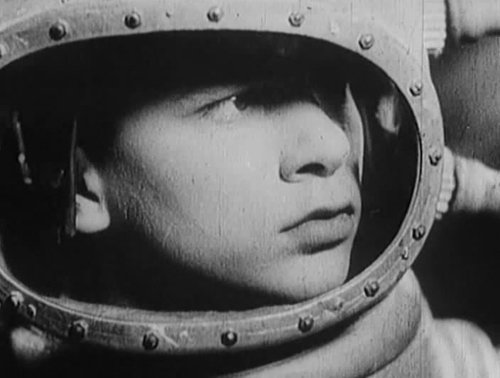 Stolyarov later played one of the leads in the two-part subtle sci-fi submarine film The Secret of Two Oceans (1955-1956), as well as one of the leads in the space opera Andromeda Nebula (1967). His character’s name in that film was Dar Veter, and although it is a heroic character, it is widely believed to have inspired the name for George Lucas’ Darth Vader in Star Wars (1977). All in all, Stolyarov acted in four different Soviet science fiction films (five if you count The Secret of Two Oceans as two) between 1935 and 1967, which must make him the one of most prolific Soviet sci-fi actors of the era. The script is well written: the adventure is exciting and both the flight and the moon scenes carry with them a sense of awe and wonder, and must have been quite amazing for the audience at the time. There is a good deal of humour, and it is actually funny. Perhaps the best parts involve the fussy, but caring wife of Sedikh, who packs his bag full of clothes (including a suit and tie) for his trip to the moon (he of course unpacks and fills the case with books, at which she frowns lovingly). She also rushes to the space station when she discovers her poor husband has left his warm felt boots at home, and tries to explain to the guard that ”it is 270 degrees below zero on the moon”, and he will need his boots (these sort of felt boots were a thing of pride for elder Russians at the time, and carried immense symbolical as well as practical value). The wonderful actress is unfortunately uncredited. 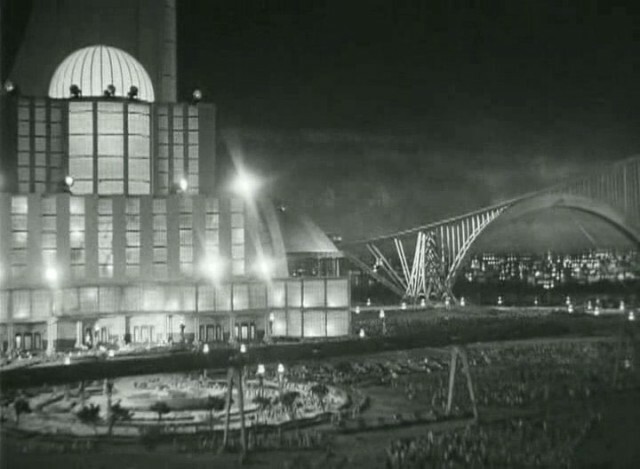 The impressive opening shot of the film shows a futuristic view of Moscow in 1946. 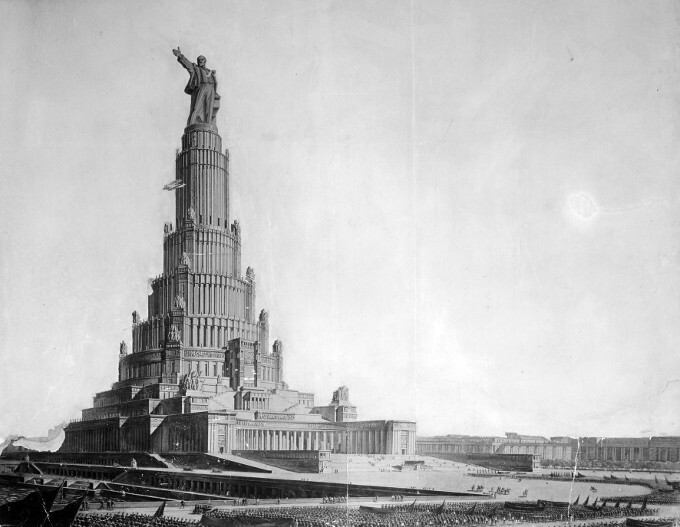 A fun fact is that the movie shows the finished Palace of the Soviets, which was actually never built. (*For more on the Palace of the Soviets, see the end of the review.) Overall the Tsiolkovsky-designed miniatures are all first class, as are the designs for both the moon and the spacecraft. There is also a pretty cool stop-motion sequence in which the camera pans 360 degrees around one of the spaceships, and you can see various cars and trolleys shuttle around it. All the people are stationary, as they are quite obviously figurines. Curiously enough for a ”western” viewer, the film is silent despite the fact that sound cinema had been around for eight years at this time, and silent movies had been dead since 1930 in Europe and North America. Many Soviet filmmakers were already making sound films, but partly because of the widespread poverty, many cinemas outside the largest cities hadn’t yet been updated with sound equipment. Therefore, many films intended for propaganda use were still made without sound. When the film was rediscovered in 1983, it was outfitted with a synchronised score. The filming itself is not special in any way, but very apt for a juvenile adventure story, and the special effects are very adequate for their time. 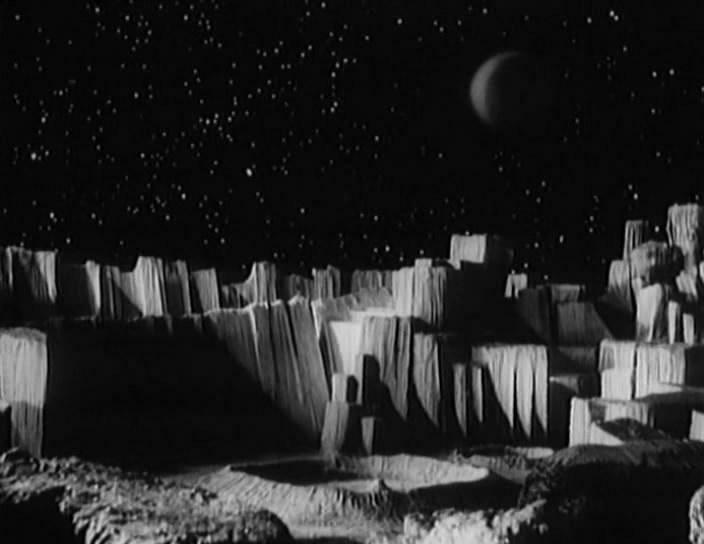 The miniature photography is a bit shaky at times, and the matte paintings a bit crude, but the lighting and design of the moon sets is superb. There is a sense of lightness and fun throughout the film, and it is one of those movies where you know everything is going to turn out alright in the end, despite the dangers. It channels the sense of adventure of a Jules Verne novel, and despite the plot against Sedikh there really is no bad guy in the movie. Rather, both Orlov and Karin are genuinly worried for Sedikh and his crew, and are overjoyed when their mission is accomplished and they return home safe and sound. Of course, this wouldn’t be a Soviet film without some Soviet propaganda, but the fact is that we are spared the most pathetic revolutionary speeches, and although there is much talk about being a good comrade and bolshevik, this is no more overt than the patriotism of many contemporary American films. Often one hears mutterings of communist propaganda when for example a spacecraft is dubbed Joseph Stalin, or somebody writes USSR in giant letters on the moon. But then again, who raises an eyebrow when a ship is called the George Washington, or an American flag is placed on the moon? In fact, Cosmic Voyage is no more overtly propagandistic than Independence Day (1996) (perhaps even less so). Beautiful miniatures depicting the space headquarters, the take-off ramp and a futuristic Moscow skyline. As stated, the book retains very little of Tsiolkovsky’s original novel, apart from the depiction of the space flight and some proceedings on the moon. Instead, the film borrows the premise of a moon landing from Fritz Lang’s Woman in the Moon. Script writer Alexandr Filimonov even copies the setup of the old scientist, the pert young woman and the stowaway kid. This being a kiddie film, most of the romantic angle is disregarded. Zhuravlyov is quoted as having thought of the idea back in 1924, but this might simply be an attempt to cover the obvious influence of the Lang movie. Zhuravlyov is widely regarded as one of the pioneers in Soviet children’s cinema. Kosmicheskiy Reys was almost completely forgotten for decades after the censors pulled the film from distribution. Its international circulation was minimal until the late eighties, so claims that it would have been a huge influence on the American sci-fi films of the fifties are utter bogus. A fairly well preserved copy emerged in 1983, and was shown with much spectacle on national TV. The film was followed by a studio discussion with the aged Zhuravlyov, popular scientist and media personality Sergei Kapitsa (a sort of Soviet Neil deGrasse Tyson) and cosmonaut Nikolai Rukavishnikov – the first civilian Soviet spacecraft commander. The film was widely praised, and so Zhuravlyov luckily lived to see the film’s reputation restored. He died just two years later. Today Cosmic Voyage is by far the best known of his films. 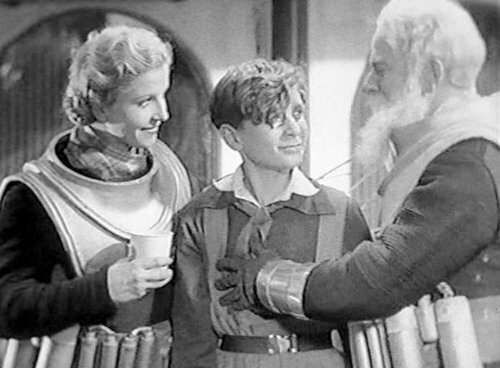 But during most of his career he was best known for his many maritime-themed children’s films, one of which was an adaptation of Jules Verne’s book Captain at Fifteen. 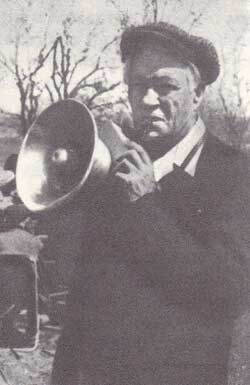 Most of his films were aimed at children, and often told stories of Russian and Soviet wars. Another very successful film was his last one, the fairy-tale The Rider of the Golden Horse, which was based on Uralic Bashkir legends. 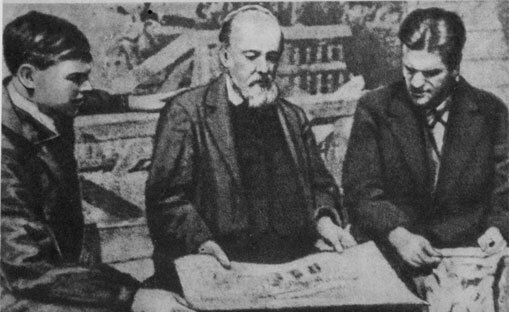 Art director Yuri Shvets, scientist Konstantin Tsiolkovsky and director Vasili Zhuravlyov. Konstantin Tsiolkovsky is one of the most revered scientists in Russian history, and is widely regarded as one of the most important scientists in the world regarding the development of rocketry and space flights. He published over 400 scientific papers and books, as well as novels, during his lifetime. He built Russia’s first aerodynamics laboratory (in his apartment), and built the country’s first wind tunnel in 1897. Before devoting most of his time to rocket theory and space flight, he tried to make a design, not of a lead zeppelin (The Mythbusters did that), but of a metal dirigible. Tsiolkovsky was completely self-taught, and was just as interested in the philosophy of space travel as the science. Many of his novels and scientific books explored the effects that space travel would have on the human mind and society, and he envisioned a peaceful international co-existence in outer space. He was convinced that man would ultimately inhabit the entire galaxy. As opposed to later followers, Tsiolkovsky never actually tried to build a rocket of any kind, and most of his work was purely theoretic. In that sense, his involvement in Cosmic Voyage was a final chance to, in a sense, see many of his works realised in the physical world. He is reported to have been very enthusiastic about the film. Sadly, he passed away four months before the movie was premiered. Interestingly enough, Kosmicheskiy Reys seems to be the only film based on Tsiolkovsky’s works. The crazy plans for The Palace of the Soviets. Cosmic Voyage. 1935, USSR. Silent. Directed by Vasili Zhuravlyov. Written by Alexandr Filimonov and Konstantin Tsiolkovsky. Based on the novel Beyond the Planet Earth by Konstantin Tsiolkovsky. Based on the novel Woman in the Moon by Thea von Harbou (uncredited). Starring: Sergei Komarov, Ksenya Moskalenko, Vassili Gaponenko, Nikolai Feoktistov, Vasili Kovrigin, Sergei Stolyarov. Cinematography: Alexandr Galperin. Art direction: Yuri Shvets, Konstantin Tsiolkovsky, M. Tiunov, Alexei Utkin. Visual effects and stop-motion animation: Fyodor Krasne. Technical advisor: Konstantin Tsiolkovsky. Produced by Boris Shumyatskiy for Mosfilm.